Dogs and kids make a great combination under the right circumstances and often form lifelong bonds when they grow up together. When a dog is afraid of children, though, it's not always safe to bring them together. It's actually fairly common for dogs to be wary of kids (and vice versa), and if your dog is among them, there are ways you can address its fears to help prevent confrontations. Why Do Dogs Fear Children? There are two major reasons that dogs may develop a fear of children. A lack of early socialization: Dogs who aren't exposed to children as puppies may become fearful when they meet them later in life. When they encounter children for the first time as adult dogs, they may be extremely frightened by the unfamiliar size, smells, noises, and movements of children. The aftermath of a negative experience: Dogs may also develop a fear of children after a painful or unsettling interaction. Young children often have a tendency to pull tails, grab handfuls of fur, steal toys, and even poke eyes. Some dogs are tolerant of children's poking and prodding. Other dogs may develop a fear of children after only one bad experience. And for other dogs, it may take several negative experiences to instill a phobia. Because it's unlikely that a dog will go through its entire life without ever meeting a child, it's important that you work on managing your dog's fear. This is not only for the sake of your dog; it is also important to prevent dog bites to children. Fortunately, there are a number of things you can do to minimize your dog's fear around children. If you have just brought home a puppy, start socializing it with children right away. Keep in mind that all interactions should be supervised and kept as positive, upbeat, and calm as possible. Working on socialization now may save you lots of time, effort, and anguish later on. Many people have pets before they have children. Then they're surprised when their dogs growl or snap at the new infant or toddler. This can be a heartbreaking situation for the dog owner and the dog, but the key to preventing the problem is early and frequent socialization. Never leave your dog unsupervised with children. This should be the rule for all dogs but especially for a dog who's afraid of children or if it's not known whether the dog is afraid. Prematurely leaving them alone to play puts both the dog and the children in a bad position that can result in even greater fear in the dog or a bite for the children. When a fearful dog (or a new dog) is around children, don't take your eyes off them for a second. Don't force your dog to make friends with a child. Making your dog stand still while a child approaches it or pets it is asking for trouble. If a fearful dog is pushed too far beyond its comfort zone, aggression can be the result. Don't put your dog in a position where it feels forced to defend itself. All dogs need a quiet, safe space where they can be left alone. If your dog is afraid of children, make sure it has a safe, quiet spot it can get to when children are around but that the children cannot access. If your dog is crate trained, a crate makes a perfect hiding spot. Don't allow children anywhere near your dog's safe area. If you have children and a fearful dog living in the same household, it's important that your children have rules to follow. They should never be allowed to interact with the dog unsupervised, and they shouldn't be permitted to try to take the dog's toys or approach the dog while it's eating or sleeping. It's also important that you spend time teaching your children the right way to interact with dogs. This includes how to touch your dog with gentle petting rather than poking, prodding, and pulling. Desensitization is the process of slowly introducing your dog to children to make it more comfortable with them. Because a fearful dog can become aggressive, it's important to handle desensitization carefully. 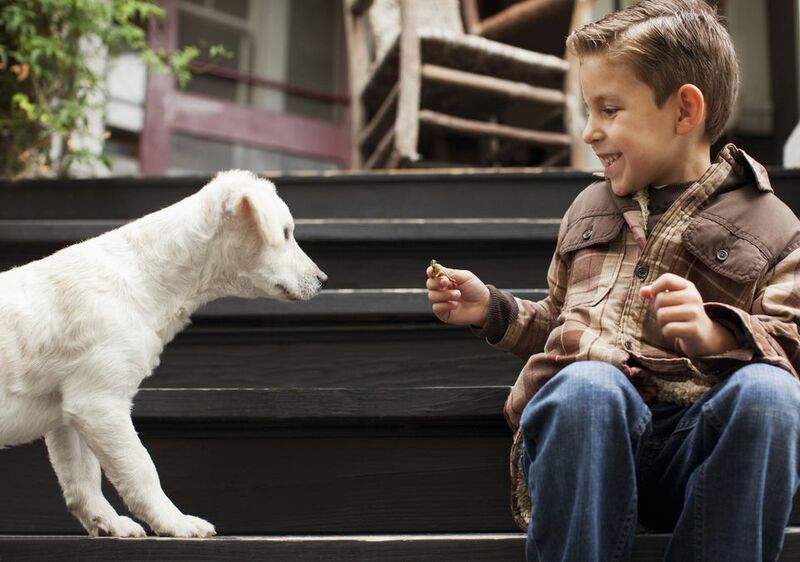 You can start by tossing your dog a few treats when it sees children from a distance. Very slowly over the course of several days, weeks, or months (depending on the severity of the fear), you can decrease the distance between your dog and children. Find a dog trainer or behaviorist with experience in dealing with fearful dogs. Because dogs who are afraid of children run the risk of biting, it may be beneficial to call in a professional. A trainer or behaviorist can help you implement a desensitization program. Be sure you enlist an accredited veterinary behaviorist, preferably one who specializes in dogs who are afraid of kids. These things can take a long time. Even so, your dog may never fully accept children, but you can at least minimize its fear and lower the probability of dog bites.